Friendly and supporting environment is provided that encourages hard work and academic achievements. Tutorial and pastoral care of high priority is given. The facilities, from a well-equipped laboratories, libraries,games and other related activities are matchless. When Compared with other institutions in the close vicinity. 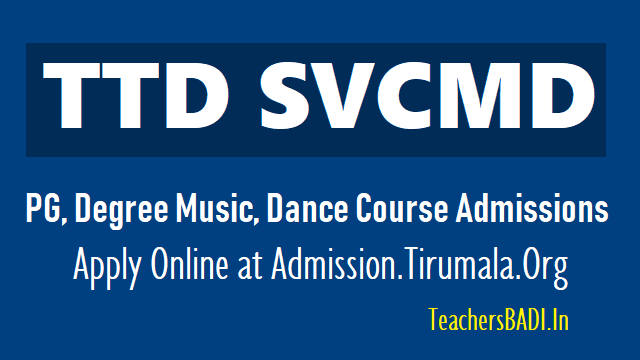 Intermediate/ 8th Class/ Visarada/ CC/ Diploma/ B.Music/ B.Dance/ Degree. 1. Mere attending to the interview does not confer right for a seat. The candidates must present himself / herself physically along with necessary certificates / Documents for verification. 2. The Candidate should pay the Tuition Fee (as the case may be) and Special Fee on the day of the admission interview otherwise the seat will be cancelled. 3.D.D. (Original) for Rs.50/- (Non-refundable) drawn in any Nationalized bank payable at Tirupati in favour of THE EXECUTIVE OFFICER, TIRUMALA TIRUPATI DEVASTHANAMS, TIRUPATI towards registration and processing fee which has to be enclosed to the filled in application. Last date for submission of application: 30.06.2018.